ANSI standard Z358.1 is detailed in terms of defining what is appropriate for safety showers and eyewash stations. As lab managers and employees, we know that many inorganic chemicals (such as the mineral acids and alkalis) are corrosive to the skin and eyes. Likewise we are aware that many organic chemicals (such as acid halides, phenols, and so on) are corrosive and often toxic. Yet we Safety Guys are continually shocked by laissez-faire attitudes toward the use and maintenance of basic safety equipment by lab personnel, and the resultant unnecessary injuries. In 29 CFR 1910.151 Medical Services and First Aid, it states that “where the eyes or body of any person may be exposed to injurious corrosive materials, suitable facilities for quick drenching or flushing of the eyes and body shall be provided within the work area for immediate emergency use.”3 OSHA doesn’t provide more specifics regarding what constitutes “suitable” or how “immediate” is defined. So how do we know if we are meeting the intent of the law? Fortunately, we have the American National Standards Institute (ANSI), and their consensus standard Z358.1, last updated in 2014. This ANSI standard is very detailed in terms of defining what is appropriate for safety showers and eyewash stations. In fact, OSHA uses this reference as a guide when inspecting facilities. So let’s review what is “recommended” for acceptable safety equipment. Begin by checking your facilities for the proper hardware, as recommended by Z358.1. Rest assured that OSHA will, should one or more agents show up for an inspection. For safety showers, the shower head must be capable of flowing 20 gallons per minute (gpm) at 30 psi and producing a 20-inch diameter spray pattern at 60 inches above the surface where the user stands. The center of the sprayhead pattern should be at least 16 inches from any wall, door, or obstruction. It is recommended that the shower head be mounted between 82 and 96 inches off the floor, with the valve no higher than 69 inches. Eyewash stations target just the eyes and therefore have a lower flow requirement. ANSI Z358.1 recommends a flow of 0.4 gpm also at 30 psi. The nozzles should be at least six inches from any obstruction and mounted between 33 and 45 inches above the floor. An eyewash gauge should be used to verify and test the flow pattern. 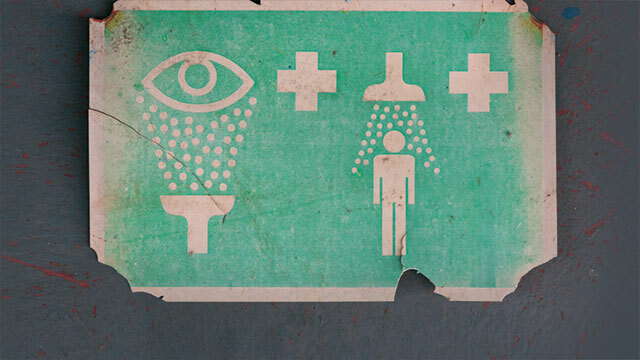 Both safety showers and eyewash stations must be able to provide the recommended flow for at least 15 minutes. This usually translates into having the equipment plumbed in with hard connections to the water supply. For example, a quick calculation for the safety shower at 20 gpm yields 300 gallons needed. Self-contained or personal wash devices are allowed, but they are considered supplemental units that can provide immediate flushing while transiting to the permanent fixture. If the local climate presents potential for freezing conditions, the equipment must be designed to avoid freezing or protected against that situation. Activation valves must open within one second and remain open until intentionally closed or turned off. It goes without saying that these safety devices should be constructed of corrosion-resistant materials. The 2014 update to Z358.1 added two important criteria. The first is that the requirement for tepid water is now defined as having a temperature of between 60 and 100 degrees Fahrenheit (15 to 37 degrees Celsius). The second change addresses simultaneous operation for combination units. This means that if you have a drench shower combined with an eyewash station, both devices must provide adequate flows and be fully operable at the same time. Finally and most importantly, consider the location of equipment. We know you have the 10-second rule etched into your brain, as that is the most critical element when it comes to safety showers and eyewashes. This means that travel to the unit should be under 10 seconds for all hazardous areas that need this equipment. This equals about 55 feet. In addition, the drench shower or eyewash must be on the same level as the hazard and have a clear path for travel. We recommend painting or marking the floor area underneath the shower to help keep it clear. Z358.1 also recommends equipment be installed in a brightly lit area and marked with a highly visible safety sign. The last thing you want is to rush to the eyewash or shower, only to be drenched with nasty, sediment-laden water. ANSI recommends flushing all equipment weekly to verify proper flow, and clearing the plumbing of any deposits. If your facility does not have floor drains installed, remember to bring a large, plastic trash can to catch the water. The weekly flushing can also provide a great training opportunity to refresh the operation and travel paths for your employees. If you want to find out about the ANSI/ISEA Z358.1 significant requirements, attend our free 1-hour webinar on September 21st, 2017. Register now and become subject matter experts of your emergency eyewash and shower equipment including weekly and annual testing. Request a certificate of attendance after the webinar. 1. “tert-Butyllithium Claims Fellow Chemist at UCLA,” Chemistry Blog, January 19, 2009, http://www.chemistry-blog.com/2009/01/20/tert-butyllithium-claims-fellow-chemist-at-ucla/. 2. “Lab Safety Chemical Exposures Incidents,” American Industrial Hygiene Association, https://www.aiha.org/get-involved/VolunteerGroups/LabHSCommittee/Incident%20Pages/Lab-Safety-Chemical-Exposures-Incidents.aspx. 3. “Medical Services and First Aid,” US Department of Labor, Occupational Health and Safety Administration, https://www.osha.gov/pls/oshaweb/owadisp.show_document?p_table=STANDARDS&p_id=9806. On a eye wash station mounted on a counter top, how far can they paddle be from an object ? Thank You. The push flag needs enough space around it to be able to be pushed all the way down to activate the unit. The only measurement within the ANSI Z358.1 that relates to this is that the eyewash head(s) need to be 6 inches from the wall.